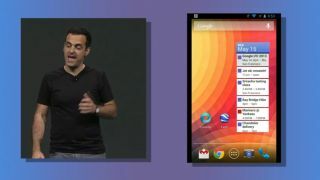 Google today announced its very own take on the Samsung Galaxy S4 during the Google IO developers conference. The device runs stock Android 4.2 with the same software that runs on the Nexus 4 - meaning it's essentially an S4 without the heavy TouchWiz touch. It will cost $649 unlocked (with an unlocked bootloader) and house 16GB of storage. Users can pick it up starting Jun 26 via the Google Play Store. The device will support LTE on T-Mobile and AT&T, and there's no word yet on international carriers. "It's Google's take on Android," Hugo Barra of Google said, which while a bit of a "no duh" comment, also points out that Google views this handset as a "true" Android device built in its vision. There appears to be no changes on the hardware front for Google's version: this is the 1.9GHz quad-core version of the phone with all the specs intact. The changes are on the skin front, with the device running the Nexus 4 user experience all on Samsung's massive 5-inch Super AMOLED HD display. Samsung's Galaxy S4 shares the "phone of the moment" spotlight with HTC's One, though this Google take on the Sammy machine looks like it will fly solo for now. "HTC is not currently planning a 'Nexus Edition' of the HTC One," Jeff Gordon, senior global online communications manager at the phone maker told TechRadar. You can read all you need to know about the new device in our handy "what you need to know" run down.